San Francisco Ballet kicks off its new season with a whooshing, leaping, swirling, castanet-clicking flourish. 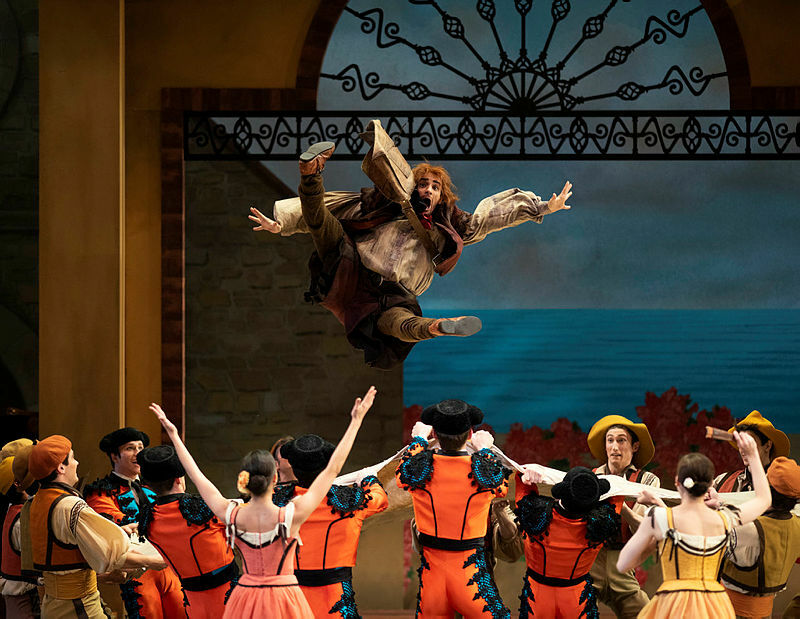 The company’s version of “Don Quixote” is so light and lively, so well danced and so much fun, I ‘d recommend it to anyone, even ballet novices. After a brief Prologue, the story begins and ends in the sun-filled town square into which Don Quixote and Sancho Panza wander, on a live horse and miniature pony, in their quest for adventures in chivalry. 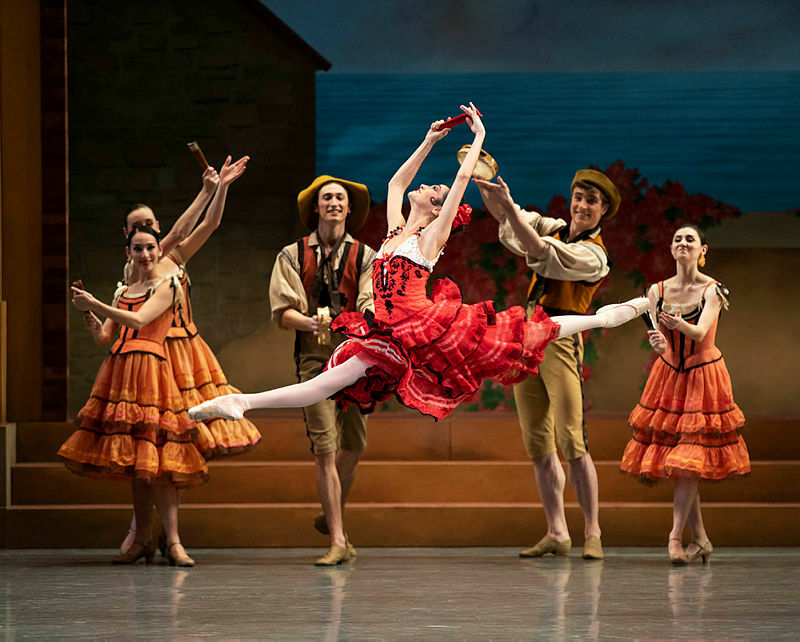 While we see Don Quixote battle that infamous windmill and dream of courtly love, the ballet centers on two young lovers, Kitri and Basilio, battling classic parental disapproval. 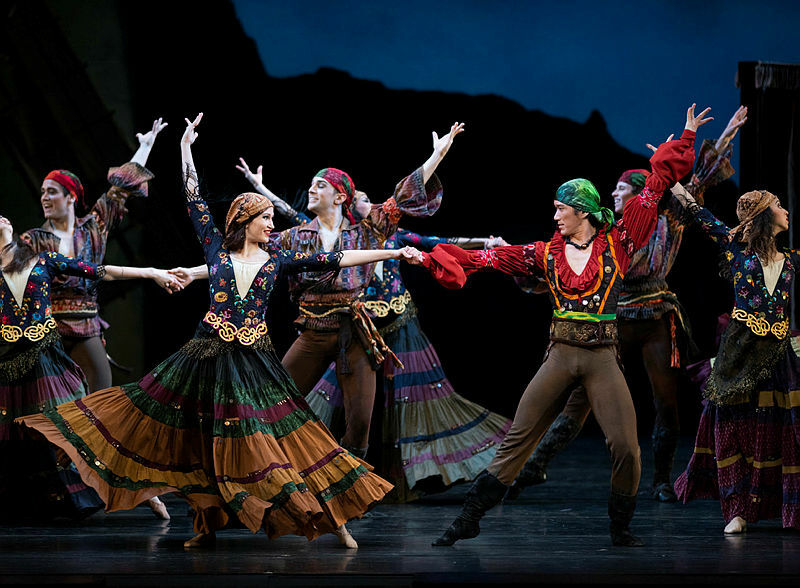 Kitri’s father wants her to marry Gamache, a hilariously oafish rich gent, rather than her poor but beloved Basilio. This Russian-born ballet is infused with Spanish touches: guitars and tambourines, flirtatious maidens with snapping fans, toreadors with whirling capes, head-scarved gypsies in a moonlit camp, intricate steps with flamenco flourishes. The gorgeous costumes—traditional tutus and tights, flounced dresses and brocade-trimmed jackets—also mix Russian tradition and Spanish style. Ludwig Minkus’s score gets a lively workout by the excellent S.F. Ballet Orchestra, conducted by Martin West. And the dancing! So many leg-stretching leaps and tight turns—the men often ending in a quick marry-me pose, down and up in the blink of an eye. So many alluring, head-tossing pirouettes. So much splendid partnering, with perfectly timed bends and twirls and light-as-a-feather lifts. This is not the “Don Quixote” created by the Russian master Marius Petipa in 1869, nor the revision staged by Aleksandr Gorsky thirty years later. This version, “after Gorsky” with staging and additional choreography by Tomasson and resident choreographer Yuri Possokhov, premiered in 2003. And it is always something to savor. During the run of every ballet, Tomasson varies the casting, so you won’t find the same lead dancers performing each night. In fact, members of the corps get to dance important roles, too. Here, that includes Espada, the dashing bullfighter, and Mercedes, his lithe, fiery paramour. 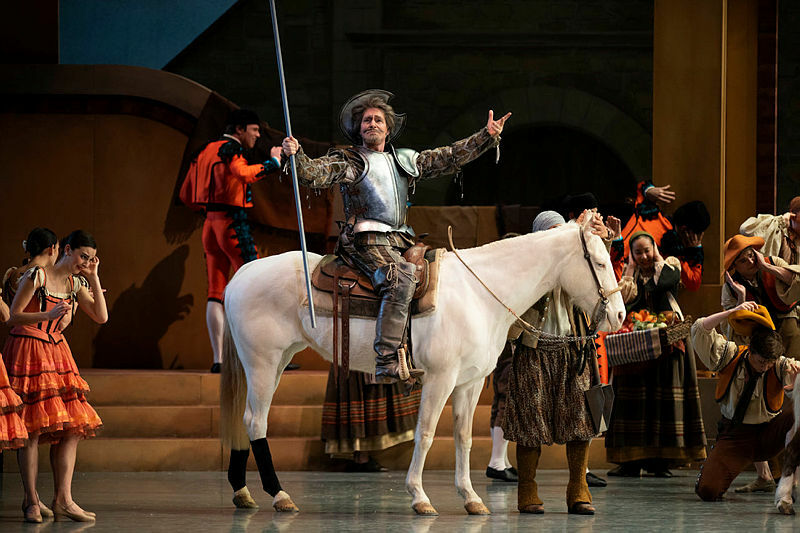 Longtime balletgoers will be delighted that Pascal Molat, who retired a few years ago, has returned to dance Sancho Panza in some performances. The opening night lineup will repeat on Wednesday and Saturday evening. But this company is so strong, you truly can’t go wrong no matter who’s dancing. And this “Don Quixote” is one ballet that gets an audience whooping periodically and cheering loudly at the end. Yes, even in the opera house. “When We Were Young and Unafraid”—Smart & Relevant, at Custom Made, S.F.